The past week has been a busy week, but it has also been a blessed week in our kitchen. Last Friday, I received the Donna Hay cookbook from the Baby Rambutan who generously raffled it off during her Hen Party. Thanks, Stel, I can’t wait to try out some of the georgeous recipes! Hi Obachan! I just love the pot too! Can you believe there is only 4 small packets of saffron inside? 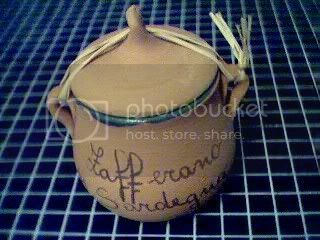 wow JMom, ang ganda ng saffron pot! Oh the pot looks so lovely! I’m glad you had such a blessed week.